You are here: Home / Resource Center / Blog / Does My Baby Need Vitamins? Being that we’re about all things food and wellness, at BEABA we get a lot of questions about vitamins. Does my baby need them? We asked Registered Dietician Nutritionist Whitney English Tabaie of Whitney E. RD to give us the full scoop. In a perfect world, babies would be obsessed with broccoli and eat everything we place in front of them, but that’s not the reality. Children can be particular about their food intake and many go through periods of picky eating. This can leave parents worrying if their child’s nutrient needs are being met and wondering whether they should give their kids supplements. Rest assured, during the first year of life, if you’re providing breast milk or formula on demand, in addition to complementary foods around six months of age, you’re likely meeting your child’s needs. However, dietary pattern, prematurity, and whether or not a mother breastfeeds can affect a child’s nutrient status. Each child is different and there are a number of factors that influence needs for specific vitamins, minerals, and nutrients, so let’s address the most important ones one by one! Vitamin D is only found naturally in a few foods including salmon and eggs. The good news is that you actually don’t need to eat anything to get vitamin D. Your skin produces it from sunlight! The bad news is that because of our increased use of sunscreen, most kids (and adults) don’t make enough of it. Plant-based children who do not consume eggs, should take a vitamin D supplement. Additionally, the American Academy of Pediatrics (AAP) recommends that breastfed babies receive a supplement of 400 IU of vitamin D daily starting at birth due to the low level of vitamin D in breast milk. Iron is an extremely important nutrient for kids. It’s a main component of red blood cells, which are responsible for carrying oxygen to the brain and cells. It’s also involved in energy production and immune function. Babies who are iron-deficient may end up with slow weight gain, pale skin, low appetite and irritability. Infants accumulate iron in utero, but at six months, iron stores begin to deplete and because breast milk is a poor source of iron, babies need to start getting it from their diet. The AAP recommends that breastfed babies supplement with 1 mg of iron/kg of bodyweight starting at 4 months, until they begin to receive a reliable source from their diet. Prematurity and time of cord clamping may also affect babies’ iron stores. Talk to your pediatrician about your child’s specific needs. Additionally, parents with plant-based babies should be extra focused on iron intake.While plants have plenty of iron, the type of iron found in plants isn’t as bioavailable as that found in meat, therefore vegans and vegetarians need to eat a little more than meat-eaters. They should also aim to consume iron-rich foods with a source of vitamin C, which can boost absorption by 5-6 times! Good sources of iron include: whole grains, legumes, nuts, and seeds. Pair them with citrus, strawberries, or bell peppers to reap those absorption benefits! B12 is needed for hundreds of reactions in the body; it’s important in cell division, the formation of healthy red blood cells, and needed to produce myelin, the protective sheath around nerve fibers. Considering the importance of new nerves and red blood cells for all of us, but especially during periods of rapid growth, it’s essential to have a source of B12 in your baby’s diet. You may have read that some plant foods, like fermented soy foods, tofu, sourdough bread and sea vegetables, contain B12. They do not. They contain inactive analogues, which are similar to B12 but don’t have the vitamin activity that we need. As B12 is only found naturally in animal products, strict plant-based children will need to supplement or ensure they’re getting B12 from fortified foods such as plant-milk or nutritional yeast. Breastfeeding mothers who are vegan or don’t consume enough animal foods or fortified products should also supplement with B12. Omega-3 fatty acids, or “long-chain” polyunsaturated fatty acids (LCPUFA), are essential to baby’s vision and cognitive development. There are two types of important omega-3s in the diet: ALA (alpha-linolenic acid), which is found in plants, and EPA/DHA (eicosapentaenoic acid/docosahexaenoic acid), which are found in marine sources like fish. Our bodies can make EPA/DHA from ALA, but it’s an inefficient process. Therefore, parents of plant-based babies should aim to provide ample sources of ALA, found in things like walnuts and chia, flax and hemp seeds. They may also consider supplementing with algae oil, a plant-based source of EPA/DHA. 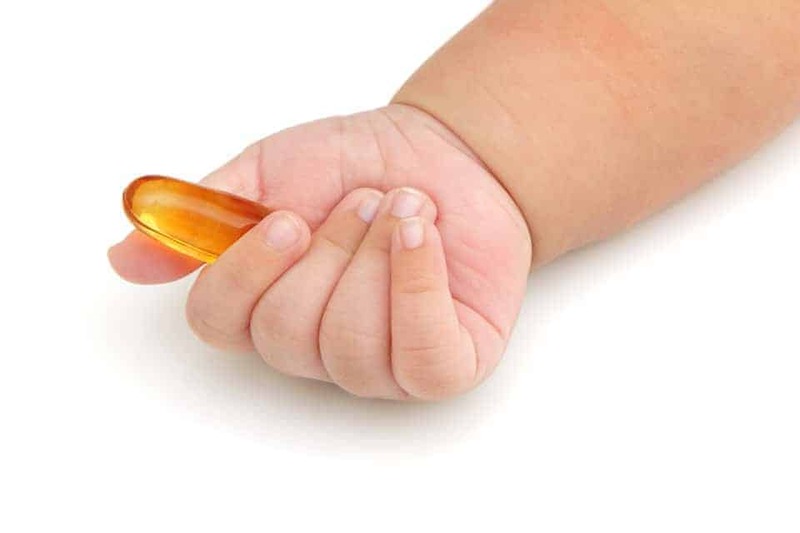 So should you give your baby vitamins? The answer is – it depends. Different babies have different needs. If your child has an extremely limited diet or excludes major food groups, then a multivitamin may be helpful as a form of insurance just in case you’re missing anything. For the average baby, a multivitamin probably won’t hurt, but it also may not be necessary. Your best bet is to get an individualized recommendation from a pediatrician or pediatric dietitian based on your child’s specific needs. And if you’re looking to optimize your baby’s diet with real food, check out my eBook, First Bites, which is packed with nutritious recipes featuring these important nutrients.